Hyperelastic material behavior can be preferably described by using polyconvex energies, since the existence of minimizers is then guaranteed, if, in addition, the coercivity condition is satisfied. 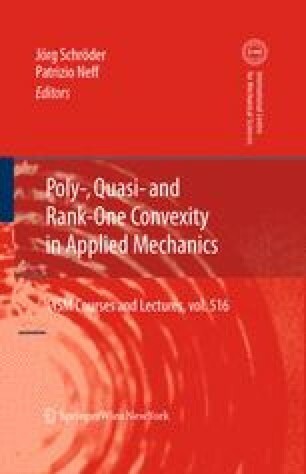 We give an overview of the construction of polyconvex energies for the description of non-trivial anisotropy classes, namely the triclinic, monoclinic, rhombic, tetragonal, trigonal and cubic symmetry groups, as well as transverse isotropy. The anisotropy of the material is described by invariants in terms of the right Cauchy-Green tensor and a specific second-order and a fourth-order structural tensor, respectively. To show the capability of the proposed polyconvex energies to simulate real anisotropic material behavior we focus on fittings of fourth-order elasticity tensors near the reference state to experimental data of different anisotropic materials.